England rested a number of key starters and managed to send off Wayne Rooney with a one-sided rout of a U.S. team that welcomed Christian Pulisic back but offered few answers for the Three Lions. The U.S. men's national team looked more like an inferior homecoming opponent than an equal in its 3-0 loss to England at Wembley Stadium on Thursday. 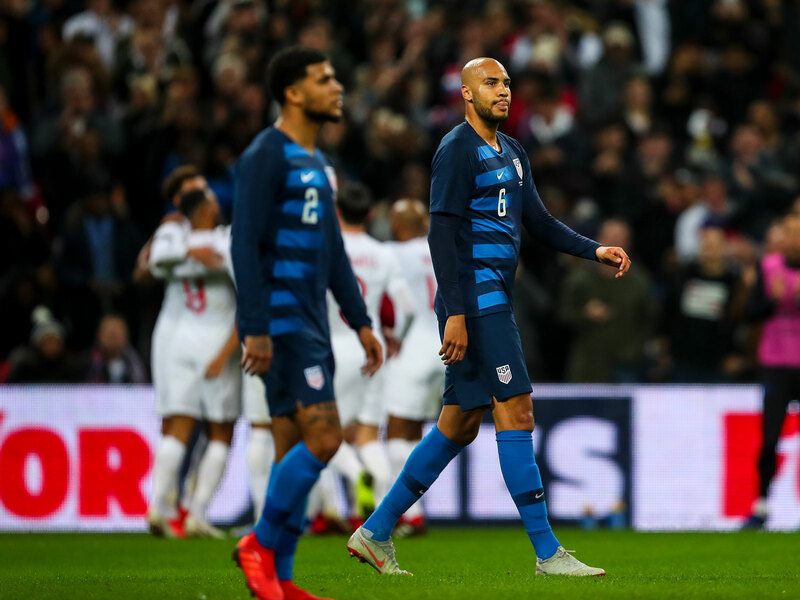 What was expected to be an exciting next chapter for the U.S., which welcomed Christian Pulisic back into the fold after a six-month absence, turned into a drab affair, with a second-choice England squad running all over the Americans in the one-sided rout. Wayne Rooney didn't score in his England finale, but his younger international teammates gave him a worthy send-off, controlling the match from the start and easing to the victory on goals from Jesse Lingard, Trent Alexander-Arnold and Callum Wilson. The U.S. will close its 2018 slate against Italy on Tuesday in Belgium, before another turning of the page to 2019, by which time a new coach should be installed and a new direction will be taken with a young core looking to tap into its full potential. From the start, the U.S. never accounted for England's pressure and aggression, and its fullbacks surging forward created even more problems for a U.S. midfield and defense that never looked comfortable. The U.S. isn't very deep right now, so to be without Tyler Adams in the midfield for over an hour from the start of the game meant being without someone who, even at 19, is arguably the most tenacious midfielder in the pool. The U.S. could have used someone like Adams in the center of the park to help win possession–the USA was overall outpossesed 60%-40%, but it was 67-33 in the first half–and someone able to break up the flow of play. Wil Trapp and Weston McKennie were simply outmanned in trying to take on that task behind a more attack-minded trio of Tim Weah, Julian Green and Pulisic. Interim coach Dave Sarachan reportedly didn't want to overexert Adams, given that he's had a full plate with the New York Red Bulls in the MLS playoffs, compounded by the travel overseas to London. That's all reasonable–though left back Jorge Villafaña is in the same boat, and was pressed into almost 90 minutes of action (most likely due to Antonee Robinson's ankle injury suffered in training). As it was, England repeatedly overloaded areas, passed through lines with ease and combined with precision against a unit that was left chasing throughout. And for all the handwringing about new players gaining experience, two of the most experienced players on the team, John Brooks and DeAndre Yedlin, continued their struggles against players they should be able to handle. The U.S. is still very much a work in progress as a whole, so a masterclass on the road at Wembley from a young team shouldn't have been expected. But the bar has to be raised from what was displayed on the field. It was as discouraging a showing as the team has had over the last year. First, the good. Pulisic was responsible for two of the USA's most dangerous moments on the day, beating a horde of England defenders to his own wayward touch, which turned into a 1-v-1 vs. goalkeeper Jordan Pickford. The Everton stopper won the battle, though, with his sliding save, and a minute later the wheels fell off for the U.S., with England scoring two goals in quick succession. Pulisic's other influential attacking moment came in the 66th minute, off a quickly taken corner kick. He received the ball and then picked out Bobby Wood deep in the England box, where the forward headed over the bar. Now, the not so good. Pulisic wasn't put in position to succeed on the day, and he should not have been deployed on the wing in this match. He plays on the wing frequently for Dortmund, so it's not like he was completely out of position, but he's more capable of filling the USA's biggest need area, which is in the center of the park. When pressed by ESPN's Taylor Twellman in a pre-match discussion on his ideal position for the U.S., he answered the No. 10 role. Defending isn't his strongsuit, and England made certain to exploit that when it could. Pulisic peeled away from Jesse Lingard before England's first goal, for instance. A more central role could perhaps mask the defensive deficiencies, at least in the areas where England was proving to be most dangerous. In terms of his physicality, Pulisic was bodied off the ball too easily at times, though he did have a late penalty shout go unheard, still hustling to the very end in a match whose result was not in the balance. Given his stature and his importance to the USA's success, Pulisic is going to have his performances scrutinized in a bigger light than most. He'll have better days in a U.S. uniform. For now, it's just encouraging to see him in one again, and the hope is that whoever takes over as coach finds a way to extract the most from such a promising 20-year-old talent. That Rooney didn't score on his farewell–and he very nearly did in stoppage time, only to be denied by Brad Guzan–was about the only thing that didn't go right for England on the day. Gareth Southgate trotted out an experimental lineup–England's least experienced since 1980, according to Sky Sports–and received a sensational, dominant performance. Regular starters Harry Kane, Raheem Sterling, John Stones and Kyle Walker didn't even play and are now fully rested for Sunday's Nations League match vs. Croatia. That match takes on a much greater significance now that Croatia beat Spain in a wild Nations League game that happened concurrently with the England win. If England beats Croatia, then it will win their group and advance to the summer semifinals (if Croatia wins, then the World Cup runner-up will reach the semis; if the teams draw, then Spain will ultimately advance). On top of all of that, the 26-year-old Wilson, whose rise from the depths of English football is a touching story, scored on his international debut, while 18-year-old Jadon Sancho continued to more than look the part on the wing and even assisted on Alexander-Arnold's goal. With a sound structure in place and a growing core of reliable players, England realizing its brighter future is way more realistic than it happening to the USA. That wasn't something that was unknown ahead of Thursday's friendly, but to see it unfold so starkly on the field hammered home the point even more.